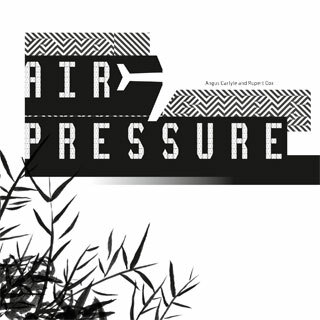 “Air Pressure” is a collaboration between Rupert Cox and Angus Carlyle. 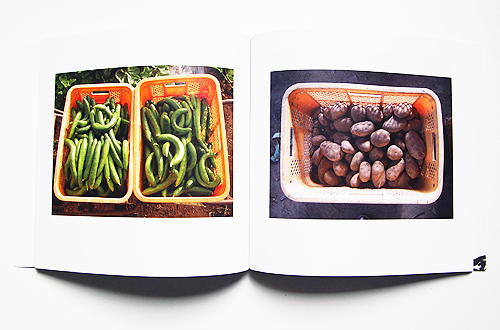 “Air Pressure” is primarily based around two periods of field work in Japan, one scheduled to coincide with the harvest in 2010 and one coinciding with the sowing season of 2011. All the recordings were made on the site of the last farming family – of the estimated 360 who arrived after WWII – who continue to make their livelihood from an organic small-holding with fields of fruit and vegetables, pens of pigs and a barn with egg-laying hens. The farmers had spent 20 years turning cedar forest and scrub into productive arable land, the fertility of the soil derived from the weathering of volcanic ash sent up by the eruptions of Mt. Fuji. And then, in 1966, the Japanese Government set about securing farming land in the village of Sanrizuka and the hamlet of Toho in order to build what was then called the New Tokyo International Airport. A bitter struggle played its violent way out over the next 12 years until the airport opened in May 1978 (with repercussions simmering well beyond that date). Farmers and their supporters built tunnel complexes, ‘fortress towers’ and chained themselves to trees; the police used water cannon, baton charges and, at one point, more than 200 construction vehicles in an effort to clear the site. There were deaths on both sides. The farm where we lived and worked is almost completely engulfed by the architecture of the airport. More than this, the environment is frequently submerged beneath the swirling, blurring din of taxiing jets, a din that is punctuated by the roaring descent of planes shuddering their shiny bulk through the sky some 80 metres above ground. 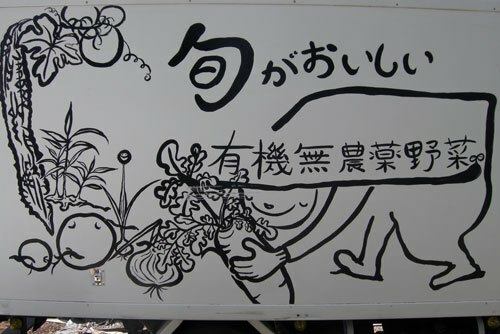 Amidst all this, the farmers – Shimamura-San, Fujiko-San and their two sons – continue to grow their 50 varieties of vegetables, supported by feelings of solidarity and committed to making things o-shi (“delicious”). “Air Pressure” has been a single-screen film (shown at the 2011 Ethnographic Film Festival), an installation at the Whitworth Gallery in Manchester and is now this book and CD. The acoustic scientist Professor Kozo Hiramatsu was a close collaborator throughout the project, with us at the farm in 2011. In 2010 we also worked with Associate Professor Toshihito Matsui (Kyoto University). Our fieldwork was coordinated on the ground with Project Manager Naoki Hayashi. Asako Murakami provided invaluable translation support and Kaori Inomata produced the incredible illustrations for the installation structure. David Morris at the Whitworth Gallery was a clever and insightful curator. Our work was generously funded by a grant from The Wellcome Trust. We dedicate this CD to the Shimamura family in our appreciation for the warm, inspiring welcome they offered us. At the western edge of the farm is where you find the animals. 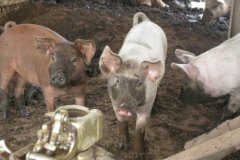 A boar and two sows and countless piglets shelter under the long barn roof, separated from each other by metal tube fences and sun bleached wooden boards. Galvanised troughs hold feed or water and the churned mud is scattered with straw. Following some inexplicable impulse the pigs will suddenly raise themselves from their fly-bothered slumber and career around the large runs behind the barn. The chickens cluck their way through the day-light like a flock of unoiled hinges, amid the steady drips of drinking water and sometimes the spinning blades of the fans, before they slowly settle down in the darkness, with the only occasional flurry of feathers or the isolated grumble from their throats to remind us of their presence. 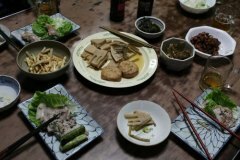 Some of the very warmest moments of our four weeks of fieldwork in Toho happened in the farmhouse kitchen. 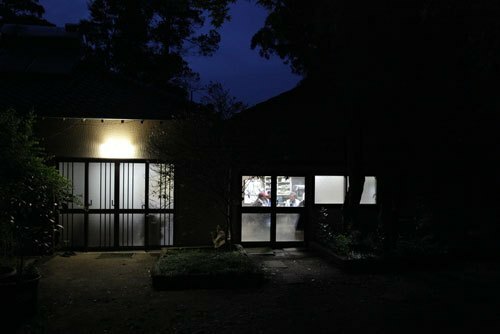 In the evenings, the long rectangular window would glow with fluorescent light and the farming family – Shimamura, Fujiko and their two sons – could be glimpsed talking, preparing food and welcoming Shimamura’s mother, who lived away in Narita. Occasionally we were invited inside, taking seats on the long benches around the sturdy wooden table. In the left hand wall, a sliding door, raised up above the floor, marked the entrance to the interior of the house proper. Tall cabinets held a library of books on organic farming and the farm’s accounts and, to the right, a long metal sink, work surfaces, a cooker with a cast iron hob and a fridge with a small television on top. The meals we ate depended on the vegetables from the farm that were ripe and in season, enlivened with meat and fish and accompanied by glasses of beer or sake or china cups of coffee or tea. On the last night, with Professor Hiramatsu and Hayashi, the conversation drifted around the table, drawing out the histories of the airport protest movement, the effectiveness of sound-proofed sleeping room and the taste of the food we were eating. 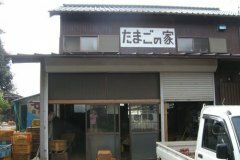 October 7th 2008: Hiramatsu and Cox visit Shimamura farm. July 2nd 2010: Hiramasu and Matsui and Cox visit Shimamura farm. 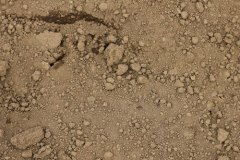 September 8th – September 19th 2010: First period of fieldwork. March 11th 2011: Tohoku earthquake. April 20th – May 7th 2011: Second Period of fieldwork. June 26th 2011: Screening of film ‘Air Pressure’ at 12th Royal Anthropological Institute Film Festival. July 2011: Audio Track ‘Three Scenes from Toho’ on ‘The Wiretapper’ CD with The Wire magazine. July 7th 2011: Phonography Colloquium, Goldsmiths College, University of London. Group presentation of project Air Pressure. “Sound becomes the dominant medium that Air Pressure archives, represents and reflects on this now historic site of resistance. Accompanying the 10 track CD is an elegantly designed booklet containing interviews, writing from both contributors and documentary photos of the farmers inspecting their land, containers filled with organic produce, as well as the collaborators engaging with their subjects … Regardless of the representational issues, Air Pressure innovatively focuses on aural culture as a means to understand the resonance, both sonic and metaphorical, of the ultimately debilitating aircraft noise on this community … The phonographic clarity of the sound can be likened to a high resolution photograph that portrays or captures its subject in stark realism. Its captivating virtual form may celebrate state-of-the-art technology, but it also raises questions about the Western recordist’s invisibility and the capturing and romanticising of its Eastern subject”. “The deeply professional and technically expert sound recording work here moves into additional non-narrative evocations through juxtaposition with five different kinds of interacting texts: essay fragments, diary entries, transcript of multivocal conversation, audiotrack transcription, and narrative track by track descriptive notes. Full-page color images, both graphs and photographs (mixing abstract and realist documentary genre conventions) are interspersed throughout. 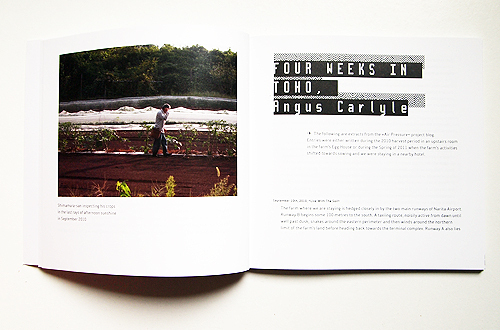 Air Pressure highlights the tension between the sounds and lifestyles of the agricultural world and the air traffic, evoking “Japan’s longest and most violent post-war civil protest, as the farming community of Sanrizuka in rural Chiba prefecture were forcibly evicted to make way for the construction of Narita International Airport,” as is stated in the … accompanying booklet. Constrained primarily to the acoustic environment, the audience becomes an active participant in decoding the layers of sound, ultimately gaining an understanding of how that which is heard and not seen provides insight into lived experiences … Air Pressure directs the audience toward the rich aural environments that are silenced in written ethnography, generating greater attention to that media ecology. ‘Air Pressure’ tells the acoustic story of life on the Shimamura family farm that nestles within the confines of Narita international airport in northern Japan. Aside from the beautiful production values on display in the book style packaging and in the articles contained within that discussing the history of this unusual set up and of the lives of the Shimamura’s this is a stunning set. From beginning to end it presents a fascinating portrait of life within this acoustically formidable environment. These recordings are at their most profound when featuring the inhabitants of the farm – either people or livestock – and displays how their lives are accompanied by the constant presence of the planes. Gruenrekorder have, for a while now, been building up a profound collection of aural documents and this should take its place at the very forefront of that collection. C’est sans doute en avion qu’Angus Carlyle et Rupert Cox se sont rendus au Japon. 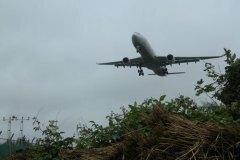 Pourtant, ce qui les y amenait était un travail d’enregistrement à faire dans une ferme familiale des environs de l’aéroport international de Tokyo. 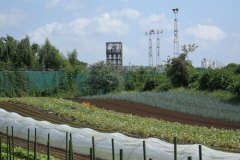 Un Notre-Dame-des-Landes à l’envers, en quelque sorte, puisque les fermiers (Shimamura et Fujiko & fils) se battent depuis 1978 pour faire pousser des légumes auprès des plateformes de béton. Rapidement, Air Pressure (qui existe aussi en versions film et intallation sonore) nous attrape par l’oreille et alors nous suivons les découvertes de Carlyle et Cox : point d’aboiements de chiens à punks ou de hululement d’hallucinés toujours pas revenus du Larzac, mais ici un temps qui coule entre les fuseaux horaires que les avions tracent dans le ciel. Entre les décollages se faufilent des oiseaux, des moteurs pétaradant, des insectes nocturnes, la télévision en fond sonore ou la pluie qui tombe goutte à goutte sur le bois (qui fait partie, je dois l’avouer, des plus belles pluies que j’ai jamais entendues sur CD). Enfin, il y a ces conversations dont on ignore le sujet qui s’évaporeront sous l’effet de l’orage. If you’ve ever bemoaned the fact that you live in a noisy part of town spare a thought for the Shimamura family. Since the late sixties the Shimamura’s have farmed the same few fertile acres of land right at the end of Narita airports runway B. That’s Narita in Tokyo in case you don’t know. 300,000 flights a year passing over the Shimamura’s heads at a height of 80 meters. The airport wants to expand its runway, the farmers want to stay put, protest groups make their voices heard. Over the deafening roar of those 300,000 planes a year vegetables grow, hens cluck and pigs squeal. Life, somehow, goes on. During a couple of working visits over a period of two years Angus Carlyle and Rupert Cox spent time there gathering sound and film footage eventually creating the installation Air Pressure. What interested them was the effect that this continuous barrage of noise was having on the farmers health and that of their farm stock. Mr. Shimamura, the head of the farm, suffers from a hardening of the neck muscles caused by involuntary spasming. He no longer hears anything. The farmers eventually got the airport authorities to build them a soundproof room in which his family could sleep. They had to fight for it but they got it. Now the airport wants to extend the runway and a farming family going back generations faces the possibility of losing their land and way of life. There’s ten tracks on here [the last is a compression of some of their recordings designed to capture the entire experience in one go] that give you some idea of what living and working at the end of a busy runway is like. It’s a no-brainer of course which is where I start to feel uneasy with the audio side of this project. For the art installation the audience were ushered into a space to be faced with two huge screens doing their best to represent the Shimamura’s suffering. At home with my headphones on I’m hearing the sounds of the farmers going about their work, birds, the odd bit of chatter, rain, wind, radio or TV and every other minute or so the god almighty teeth rattling roar of a plane going overhead. Its something that doesn’t take that long to get the message across. Carlyle and Cox have done a sterling job in highlighting the farmers torment, as have Gruenrekorder in issuing this CD in a book that carries plenty of text relating to the project plus an array of wonderful photographs but when it comes down to actually listening to it I found that after about two tracks I’d had my fill and thanked myself I was just glad I didn’t live at the end of Narita’s runway B. This is to take nothing away from Carlyle and Cox’s work or to make light of the Shimamura family’s position but I feel that what we have here audio wise is encapsulated in those last ten minutes. Why do so many albums of field recordings come attached to books of writing about their creation? What is it about this area of music that seems to attract long texts to accompany the audio? Perhaps the current trend for aligning field recording with the pointless descriptor “sound art” leads to such developments. In my experience however, the more lavish the book, the longer the texts, the less interesting the music seems to be. However one release I have been playing quite a bit over the past few weeks on the Gruenrekorder label seems to defy such a rule. Angus Carlyle and Rupert Cox’s new collection of recordings from rural Japan, entitled Air Pressure comes with a sixty-two page booklet of notes, blogpost transcriptions and photographs on the recordings. The content of the booklet is pretty good, interesting notes on the rural area, the families working within it and primarily the traumas that the farmers find themselves facing as their livelihoods are gradually encroached upon by the noise and general intrusion of the nearby airport, with jets passing over every two minutes. While the background texts are interesting, and you find yourself siding against the unstoppable destruction of the airport, and applauding Argyle and Cox for highlighting the issue, the ten tracks on the CD are what really matter with a project like this, and while recording quality here is very good, what makes the CD interesting is the content when linked back to what we learn through the booklet. Its important to note that all but the last piece here are “straight” field recordings with no editing beyond the simple selection of the track from a large archive of recordings made. While the last ten minute piece A Soundfilm brings together many of the themes and iconography from the rest of the album, nothing else here is structured, layered or edited in any compositional manner. We are presented for the most of the time with straight field recordings made on location. This then also leads me to be further surprised at how much I enjoyed Air Pressure. So often I find myself wanting the wonderful sounds people collect when field recording to be meshed together into interesting, perhaps dramatic, perhaps just beautiful compositions. Ironically, then, its perhaps the last piece here, which has been collaged together from other recordings that I like the least. Otherwise the sounds captured are all interesting enough in the context of the entire project to not only retain the interest but to inspire further thought. There is nothing here that doesn’t fit with the theme of rural life being slowly eroded, but crucially for me, there are few excerpts of birdsong, trickling water etc… when these elements do briefly appear it is in keeping with the attempt to paint a sonic picture of a particular area under threat, the sounds are here because they serve a purpose, not just because they sound good. So we hear a lot of passing ‘planes, some of them very close overhead indeed. Yet there are also tractors, wildlife, buzzing insects, and at one point, quite brilliantly the squeal of pigs, an almost frighteningly alive sound we don’t hear often, though I did hear some great recordings of such animals earlier this year that I think will surface as part of another project some time soon. There are recordings of men at work, interrupted by aircraft, of farmyard machinery at work, interrupted by aircraft, and several of the doomed calm of the countryside areas again, interrupted by aircraft. It all makes for a nice listen, a continually changing, and crucially never really boring set of recordings that go one step further than just capturing a nice set of audio photographs, rather that they tell actively highlight a tale. Good work then, a very nice listen that gives a really good feel of its subject, and a release that has pulled me back to it a few times now. Нужно обратиться к Истории, чтобы понять задачи, поставленные перед авторами «Air Pressure», Ангусом Карлайлом и Рупертом Коксом. История эта произошла в Японии, но, ее особенность такова, что случится она могла (и с большой вероятностью случалась не раз) в любой стране мира, мне даже сдается, что в нашей родной России ее бы и за Историю с большой буквы не приняли. Тем не менее, познакомимся с господином Симамура и его семьей – последними фермерами на плодоносном участке земли, который после Второй Мировой принадлежал сотням фермерских хозяйств, а 1966 году, не избегнув долгих судебных тяжб, открытого противостояния и человеческих жертв, был отдан под строительство Международного Аэропорта. Ферма Симамуры находится практически на территории аэропорта, что не мешает ее обитателям вести хозяйство: выращивать овощи и фрукты, разводить домашних животных, собирать урожай, и все это под непрекращающийся рев заходящих на посадку и взлетающих самолетов, пассажиры которых, глядя сверху на зеленое благолепие, наверняка в своем умилении не догадываются, сколько труда и сил стоит выживание на этом клочке земли. This is a ridiculously lavish affair from Gruenrekorder, with the cd accompanied by a small book containing words and pictures concerning the project. The focus of this project, are two farming families who work the land in Sanrizuka, Japan; though their farms are anything but ordinary – the soil they tend actually falls within the territory of Narita international airport. The airport was built in the early 1970s, and was the scene of intense confrontations between police and a coalition of local farmers and activists – objecting to the forced evictions of the farming community. By the time that Angus Carlyle and Rupert Cox undertook this project, there were only two farming families left – working land at the end of runway B, completely enclosed within the airport. 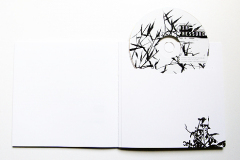 The first track, “In The Forest Clearing (Totoro)”, encapsulates the whole purpose of the album. In a nutshell, it portrays a quiet, rural landscape; with distant sirens and vehicle noise – but one thats shattered sporadically by the truly deafening thunder of planes taking off overhead. The rest of the project explores this situation and environment. So, we get nine field recordings in total, and one final track thats constructed from this source material. 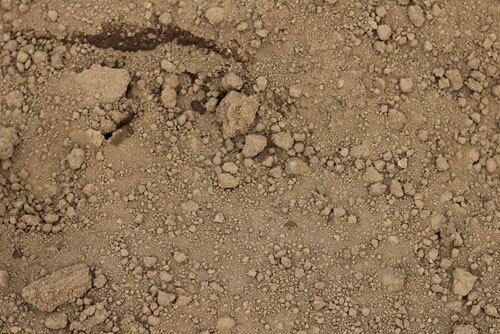 The field recordings are disarmingly honest – to my ears, anyway: at points, the recordings are marked by brief conversation between Carlyle/Cox and their subjects – something that I would normally consider an “intrusion” in field recording terms. So, the pieces are very documentarian; apparently depicting slices of time and place, untouched and unmanipulated. Though this does remain open to question, since in one of the “diary” entries in the booklet, Carlyle describes recording a skylark in England and apparently inserting it into some of the project material. Regardless, the pieces do feel very “documentary” in style – or to put it another way, there’s no sense of the tracks having been chosen for their sound or “musical” content: there’s no pretty passages of insect chirruping here. This is one of the downfalls for me, since a lot of the tracks fall flat on my ears – they make good “evidence” of the horrendous effects of the airport on the local farmers; but they’re not something I’m compelled to listen to much. However, as with life, you have to take pleasure in the details; and they are plenty of beautiful sounds to be found across Air Pressure – exquisite raindrops on “Under Wraps”, a cacophony of chickens and grotesquely visceral pig squeals on “Past The Coop, Just By the Sky” and planes transformed into the hulking, metallic monsters that they are, shadowing every track. Given the wealth of this source material, you would imagine that the last, collaged track, “A Soundfilm”, would be something of a tour de force; but its actually less listenable than the “raw” tracks which precede it. A track like this would normally construct an artificial soundscape, that transmits a “truth” via fakery: an atmosphere, a sense of place; but unfortunately, it just feels like a little bit of an afterthought – as if someone decided the album needed an overtly “musical” component. Compared to this, the dry narrative of the straight field recordings feels more satisfying. 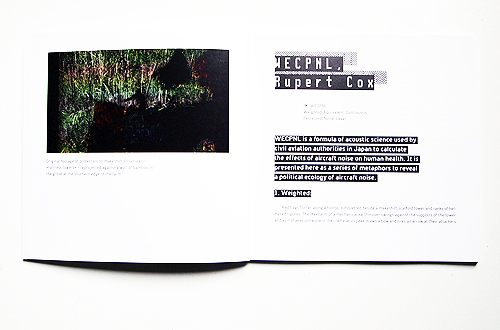 Air Pressure, a collaboration between anthropologist Rupert Cox and sound artist Angus Carlyle, is as much a book- as sound-based project, given the elaborate textual dimension that accompanies the CD (the project has also been publicly presented as a gallery-installed sound installation and film). Replete with photos, conversation excerpts, blog extracts, and in-depth track details, the booklet is a full-fledged project unto itself that holds up as a stand-alone sans the sound component. The release as a whole testifies to the integrity Gruenrekorder demonstrates in treating its projects with so much attention and care. It’s also, due to its content, a field recordings-based project that extends beyond sound documentation into provocative political, ethical, and environmental areas. 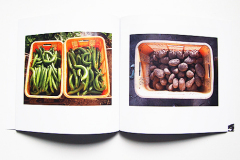 Air Pressure deals with the impact of aircraft noise on the daily life of a farm run by Shimamura-San, Fujiko-San, and their two sons and is based on four weeks of field work undertaken by Caryle and Cox in Toho, Japan in 2010 and 2011. The recordings were made at the site of the last farming family (of an estimated 360 that arrived after WWII) to draw their livelihood from the organic production of fruit and vegetables, as well as from products associated with pigs and egg-laying hens. Why the last farming family? 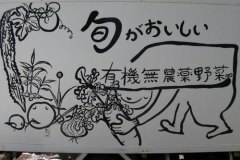 Because in 1966 the Japanese Government set about building an airport that eventually opened twelve years later, following bitter clashes between the farmers and developers. Collisions between the two worlds recur throughout the recording, with the bucolic peacefulness of the one (represented by chirping birds, squealing pigs, clucking chickens, and other farm-related sounds) invaded by the other in the form of overhead planes, whose smothering rumble repeatedly appears in the form of one deafening pass after another. Amidst the sounds of daily farm life, such as the whirr of a tractor and the trudging of footsteps, comes the roar of the planes, often so loud that it obliterates all other sounds. It’s hard not to hear its rise as a violation of the orderly rhythms of farm life, especially when fourteen jets land during a twenty-eight-minute period, and it’s also hard not to find it depressing when the conversational interactions and food preparations of the family members in the farmhouse kitchen are constantly overshadowed by airplane noise. There’s certainly no small amount of contrast between the massive jet and the simple bike that Shimamura-San uses to cycle around the farm to inspect the growing vegetables (as happens in “Wheels on Brown Earth”). The CD ends with “A Soundfilm,” a ten-minute piece that distills hours of material into a kaleidoscopic setting of rapidly shifting impressions. […] The first time I arrived in Japan, I flew into Narita airport and looking out of the window of the airplane, I thought about hills, farms and how it perhaps would look a bit like Austria. I may not have realized there might be people living there, but I guess you never do when you arrive after a 11 hour journey. Below there at Narita Airport is the farm of the family Shimamura and that’s part of the extensive project ‚Air Pressure‘ of which this CD and very extended booklet with stories about a farm below the runway of Narita airport. All of these pieces deal with the very fact that there is farm life but also lots of planes coming over. The whole project is about how it affects the farmers and their farming – organic but of course that’s not audible on the CD itself. Crops are under wraps and we have recordings of that. There is animal life, people talking and of course we hear every now and then planes. Years ago I lived close by a rail track, which you couldn’t barely hear, but still drove me insane at times, and these days I like where I am: a quiet corner in a medium sized town. Not a lot of traffic or other disturbance. I am glad I am not a farmer below a runway. That much is clear from listening and reading all of this. Here too we are hardly dealing with music per se, but it’s an interesting work from a sociological or perhaps even anthropological point of view. A documentary in word, image and sound. Everything for a great documentary that is not a movie. Great stuff that points out a few interesting questions. Food for thought.